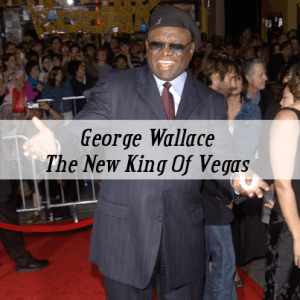 Comedian George Wallace has been making people laugh for four decades with his long-running stand-up act in Vegas and was recently crowned the new Mr. Vegas. George thought that the recent American Idol court case, where African American contestants claim that they were taken off the show because of the race and their past arrest histories, which they think were wrongfully aired out to the public. Rolling Stone recently named George Wallace one of the top 25 funniest people on Twitter. George, being active in the Twitter community, said that he recently tweeted at one of the girls from 2 Broke Girls, who he really doesn’t think that she is that broke. In addition to razzing other stars, George just likes to tweet about things he sees around him that he deems to be stupid. For example, he saw a evaporated milk at the store the other day and was left wondering what the heck could possibly be in the can if the milk is evaporated. He loves using Twitter on his smartphone, but also has something against them because they have taken a lot of human interaction out of our everyday lives. For example, you can say “no” over text message very easy, but you can really work things out when you’re talking in person. George Wallace recently received a lifetime achievement award from BET. Knowing that he was honored right along with musical groups like Earth Wind and Fire while he was still alive to be honored was a big plus to him. George couldn’t overstate how blessed he felt. He considers himself an utter success, because it has always been his dream to perform in Las Vegas, and that’s what he’s always been doing.